On August 1st we gave a last warning to clients and followers to protect their portfolios over the next 10 weeks. Specifically to reduce stocks & the USD; in order to increase CHF cash, EUR cash and Gold. Based on our proprietary geopolitical macro research we expect a serious correction between Mid August to Mid October 2015. We suggest to increase risk assets into this weakness. The next few years will not be ideal for Buy & Hold strategies! Despite aggressive monetary and energy policies, the US economy has peaked in the 2nd half of 2014. In our view the ideal time to normalize interest rates has come and gone – it was Q3 2014. The FED Chair, Mrs. Yellen, may have put herself under pressure to raise rates at the worse possible time from a global geopolitical perspective: Fall 2015. The implications are far-reaching for US economic, energy, currency and foreign policy. Had the FED not overestimated US Potential Growth and not underestimated global geopolitical risks from 2015 onwards, it would have used the economic momentum of 2014 to begin normalizing rates. Now renewed money printing and currency devaluation by China, EU and Japan makes a FED rate hike a tough sell. With many economies facing the implosion of their labor force (deflationary) and high inflation outside CPI baskets (bonds, equities, real estate etc) the FED should be actually ready to cut or raise interest rates. In May 2015 our Global Risk Barometer climbed to a reading of 9 (1-10) for the first time since 2008, indicating that conditions are present for a global crisis. Nevertheless our Global Risk Overlap Methodology (GROM) does not predict the exact trigger nor timing. FED and banks are enjoying zero rates for 7 years and say we can’t raise rates to even 0.5%, because the economy has not reached its Potential Growth yet (i.e. it has not fully recovered). But as U.S. Commerce Department data reveals the U.S. has been only growing by 2% since 2011. And if you calculate GDP per capita, then US growth was even lower. Thus, consensus has been overestimating Potential Growth, arguing that as long as Americans can’t find enough well paid jobs, rates should be zero. But this could be flawed for three reasons: 1) the consensus view takes little account of the high levels of tension and uncertainty in the global geopolitical & macroeconomic landscape; in that global context the U.S. performance is formidable and above other developed economies – Europe and Japan would dream of 2% steady growth; 2) The inability of many Americans to find better paid jobs is a structural issue that bankers can barely solve. The longer the FED tries to support a labor market that suffers from a flawed education, business and tax system, the longer politicians will delay the painful changes. Changes that could normalize profits at big businesses used to lobby lawmakers. 3) In their desire to analyze abundant data, many economists look too much backwards on labor and inflation data. Although difficult, economists should make every effort to better estimate Potential Growth. This includes monitoring global trends and looking forward to assess future risks to businesses and investors. 7 years into this extreme zero rate policy, its negative moral, political and economic side-effects outweigh the advantages. While Policy Makers receive praise for singlehandedly orchestrating a huge rally in bonds, equities and the USD over recent years, the financial system is entering a geopolitically vulnerable period with key central bank rates at zero. Thus, policy makers lack their most effective monetary tool to stabilize the economy in case of a systemic risk event. Many policy makers say they can’t normalize interest rates and stop manipulating bond prices, because the World Economy is still too fragile. They look too much through the glasses of the Financial Industry and the G7 though. More than half of mankind lives in economies that have been growing by more than 4% as a whole in recent years. The opposite is more likely – zero rates for 7 years send a very negative sign to economic agents “highest possible danger ahead” with the result that mid-long term visibility has almost disappeared. Zero rates are increasingly affecting global economic growth negatively, and the financial system is much more fragile than what the record bond and equity rallies convey. We reiterate that GDP growth in key economies will be much weaker than expected during the period of August 2015 and March 2016. Instead of 3% to 3.5% annual growth pace expected by IMF and most banks, it may be barely 1% to 2% annualized growth. As we have said before: Given the massive challenges and conflicts of interests on policy makers, we wouldn’t trust government-reported data like GDP, CPI, M1 nor Gold reserves, unless independently audited. Governments have over-extended their roles to fix and manipulate supply, demand and even prices, while still giving guidance and reporting official data themselves – all that without independent external audits. Imagine a pension fund manager choosing his own targets and reporting his own performance. In that sense the CFA Institute with its Global Investment Performance Standards fares better than our governments in governance and transparency. With policy rates at zero, the convergence of growing debt in debased money, a fast aging population, dysfunctional indirect democracies and growing geopolitical tensions will lead to discretionary use of extraordinary executive powers and bigger governments. The new course of US foreign policy pushed forward by the Obama administration – despite internal opposition – is the single most important event driving global geopolitics since 2010.President Obama has significantly downgraded the security of former Arab allies and Israel in order to reshape the Middle East, gain full access to Iranian Gas/Oil and build a stronger Islamic world. One around Turkey-Iran, both led by Islamic ideologists, perceived as radical by many Muslims and intellectuals in moderate Sunni-Arab states. Iran’s expansion in the Middle East is gathering pace: It now controls to a large extent Iraq, Syria, Lebanon, Gaza and the masses across Sunni Arab states. GROM 9: Following policy moves by Western states our Global Geopolitical Risk Barometer rose in May to 9 (1 to 10) for the first time since 2008. 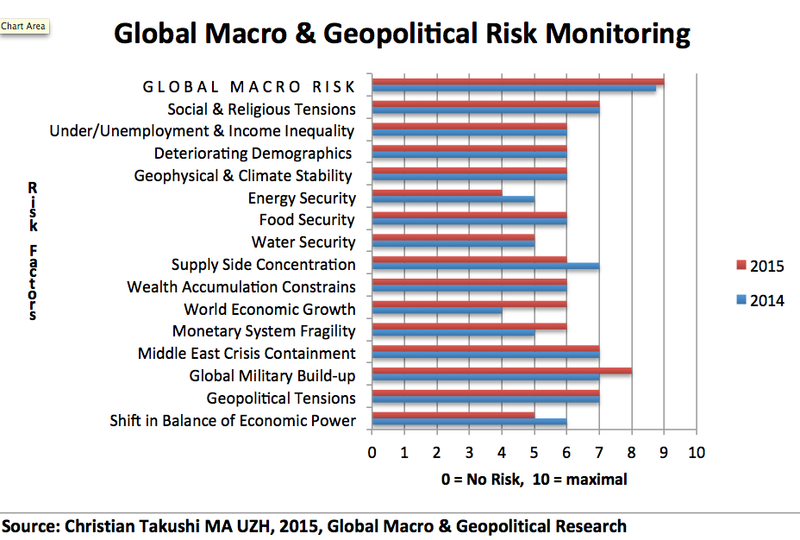 Our Global Risk Overlap Methodology (GROM) encompasses 20 geopolitical-macroeconomic factors, but does not forecast the exact trigger nor timing. We can only say that the conditions are given for a major global crisis. This U.S. backed expansion of Iran, coupled with Obama’s refusal to demand that Iran takes back her annihilation threats against Sunni Arab states and Israel, will lead inevitably to a large scale war. Fearful Sunni Arab states asked Israel to take out Iranian nuclear installations for their own common sake, but Israel declined to avoid a total breakdown of relations with the White House. Now, Arab states are seeking their own nuclear weapons and ballistic capabilities to defend themselves. Unlike the West, Arab leaders take Iran’s threats seriously and will not be blinded by public offers of peace in front of Western media. As a result of the daring Obama policy all states in the Middle East are seeking military agreements with the USA, Russia, China, Turkey, Pakistan etc. “Everyone for himself” means the arms race will now accelerate. Formerly unconditional U.S. allies like Egypt and Israel are approaching Russia for their security. Although Iran has been under a major U.N. arms embargo, Western powers have systematically looked away while China, Brazil and Turkey delivered goods and weapons to it. No surprise that large Emerging Nations feel emboldened by the West’s weakness. Obama’s Iran Deal means Iran’s Islamic militias & terror organizations will have full access to hard currency to upgrade their weapons. Hizbollah, Hamas and Islamic Jihad will have finances and freedoms they could only dream of for decades. The 5-year-long destabilization of Sunni-Arab states (the White House helped remove their leaders, thrusting those nations into chaos) and the simultaneous backing of Turkey & Iran by President Obama puts the Middle East on course for a radicalized Islamic World. The Obama strategy aims at securing Northern Iraq and Northern Syria in order to give NATO full access to Iran Gas/Oil. This means the fate of Syria has been sealed and the war there will now die down. USA is using both ultra low interest rates and ultra low oil prices as geopolitical-economic tools to neutralize US-defiant emerging and struggling powers like China, Russia, Brazil, Venezuela etc. The U.S. has taken advantage of Russia‘s preoccupation with Ukraine to court and win over Russia’s key ally in the Middle East, Iran. Flooding the oil market to keep oil prices very low was also necessary to bring Iran to the table and to send Russia’s economy into a crisis. In light of so many risks, India’s less aggressive foreign policy is attracting investments away from China. The 2nd most significant event in geopolitics is the steady retreat of Great Britain from the global military landscape. Europe can’t defend herself without Britain nor can Britain support the U.S. the way it did for 100 years. China, Japan and Russia are filling the void. Although economists warn since 2010 that Greece is a failed and bankrupt economy, EU politicians are giving over EUR 30’000’000’000 to Athens again. Money that will never be repaid. But rather than reforming, Greece gets more money from the Troika to repay due loans to the same Troika. An economic and political farce of unprecedented proportions at the expense mainly of German and British taxpayers. The Greek people would do better by exiting, defaulting and reassuming their self-responsibility for their future. Political leaders and mainstream media will have to redouble their mis-information to convince UK voters not to exit the EU. A union of abused solidarity, trimmed self-responsibility (entitlement-thinking) and rising default risks. The longer Greece stays in the Eurozone, the higher the risk of a UK exit of the EU. A UK exit could trigger a German Exit. Consensus is complacent about a Brexitand in denial about a Gerxit. Berlin will try to connect the Greece solution with the UK exit question, in order to increase pressure on reform-reticent EU nations (that want no change to the status-quo as they receive some 1’000 million euros a month in transfers) to accept a partial reform of the EU treaty. The EU can digest an exit of Greece, but not a UK exit. The UK is the only serious military power in the EU and vital to EU’s global geopolitical aspirations. The UK is the largest ally of Germany for Market Economy, Fiscal Discipline and Reforms. Austerity without reforms lead no-where. Tensions in the Middle East are rising and will reach a mid-term climax in September 2015. It is very likely that a major global crisis will be sparked between mid-August and mid-October 2015. This Risk Measure is relevant for governments, multinational corporations and international investors. It is continually monitored and updated here within 3 hours after a significant rise or drop is measured. We are monitoring a steady increase in global tensions and risks. During the Spring of 2015 our Global Risk Barometer reached the level of 9, which tell us thatconditions are present for a serious crisis in the remainder of 2015. This Global Risk level has only edged higher since the controversial US-Iran Deal. While celebrated in the West, the tremendous blow against the security of Arab states has set the Middle East on course for two wars that could involve nuclear weapons. Still, a crisis needs a trigger and triggers are hard to predict. Nevertheless we see 8 out of 20 global trends we monitor are overlapping over the next 6 months, with maximum frictions around September 2015. People should start scenario preparations and contingency plans for their businesses and families. We have been warning about this peak in tensions in autumn 2015 for at least two years. See our post from May 6 2015 on interpretation and analysis of this comprehensive risk barometer. The world economy is growing at a 3.3% annual pace and the IMF expects it to accelerate to 3.8% in 2016. Although I agree economic momentum is gathering pace, I see the rising likelihood of a sharp decline in global economic growth in Q4 2015 from 3.3% to 2.5%. The shock could continue until spring 2016. Currently the world economy is split in 3 distinct groups: (1) Developed nations in crisis mode but edging higher; (2) Large Emerging Nations like the BRICS slowing down below 5%, (3) by far the best group comprises developing and smaller emerging nations, many of which are growing at 3-5% p.a. In fact, 2/3 of mankind live in growing economies. Our prediction that large Emerging Economies would be in serious trouble has come true since 2013. Expecting the first rate hike by the FED, many investors overlooked the rise in US interest rates in relative terms over the past year -magnified by a 32% rise in the USD vs key trading partners over three years. Main reason why we expect Europe to beat estimates in 2015 while the US slows down. As we have maintained since 2010 the FED is co-responsible for weak economic growth and muted inflation; additionally a too-cautious FED has missed the ideal time to begin normalizing interest rates (that was Q3 2014). As a result US policy makers are trying to restart the US economy this summer. If a crisis or weak data hits before the rate hike, this overly cautious FED may call off the rate hike, triggering a USD sell-off. Traders have been buying the USD in expectation of a rate hike since 2012. Consensus seems too complacent on a “long USD, short Euro” view. We believe the USD is over-extended and we’ve been expecting a moderation since June, but have been obviously too early on this call. The Euro could surprise investors and recover swiftly if the EU accepts partial reforms of the EU treaty, something we expect Berlin will push through to satisfy UK voters. As large emerging economies weaken and developed economies try to support growth with artificial asset price inflation, frontier and mid-sized emerging economies are proactively adjusting policies and laying the ground for continued growth. Some of the most pro-market measures of recent years were neither found in G7 economies nor BRICS, but in smaller emerging economies. Organic sustainable growth can be found in some younger economies (group 3). We keep our outlook expressed in Q1 2015: The European economy will do better than expected and grow by 1.5% or more in 2015. The USA and Japan will rather disappoint as artificial asset price inflation needs ever larger doses. The UK may cool down under the uncertainty of a possible Exit of Great Britain (Brexit) from the European Union and rekindled calls for Scottish independence. The uncertainty will also weigh on the British Pound. We keep still our 3-year-old Negative Outlook on most Large Emerging Economies. They are suffering, because they were spoiled by investors seeking simply “size” instead of “fundamentals”. Investors went for the largest market, the largest population, the biggest so and so, all the way ignoring that most of these nations are far away from having a Free Market Economy and the transparency of a democracy. Despite multiple challenges, mid-sized economies like Nigeria, Peru, Colombia and Indonesiashould fare better than the large EM’s. Investors remain too pessimistic about Russia, and too optimistic about Thailand. Longer term though, the USA should be the most dynamic major economy (followed by Germany) powering ahead of the rest, specially vs China. This, provided the USA can avoid a large-scale disaster and breakdown of social order. Something the US military and FEMA are preparing for with vast mobilization of resources. China will be digesting the doubling of her demographic dependency ratios (old to young), which will choke discretionary consumption. Watch China import data. Thailand, Chile, Taiwan among other economies will see a similar implosion of their labor force, thrusting these nations into political instability and lower economic growth. Mid to long term the implosion of the Labor Force and the dramatic deterioration of the Old-to-Working Dependency Ratios in key economies such as China, Japan, Germany etc will weigh significantly on discretionary consumption, corporate profit margins and economic growth. Thus, potential economic growth will experience a renewed decline. The U.S. FED has been overestimating U.S. Potential Growth over the past 5 years; one of the reasons it failed to raise rates earlier. Given the widespread negative sentiment on the whole commodity complex, related economies and currencies that has prevailed in recent years, a technical rebound in these currencies and economies is possible at any time. While official CPI figures remain muted, inflation among asset prices outside of CPI baskets is running high – driven by excessive money-printing. Asian giants China, Japan, South Korea and Taiwan are exporting deflation to Europe and USA. WARNING: on 15 July 2015 our Global Business Risk was raised to LEV-AL Status 4, see details below. Businesses and investors should be aware that some disruptions to their operations are possible and prepare accordingly. Against the backdrop of our two risk barometers deteriorating in recent weeks (crisis possible and businesses could experience limited disruptions) our Geopolitical and Economic Scenarios lead me to call for a cautious investment stance for the remainder of Q3 and Q4. Given that cash can be opportunity cost, I reduce the time span for caution to the minimum: From mid-August to mid-October 2015 global investors should prioritize Capital Protection. They should consider reducing unnecessary risks, reducing structured products (i.e. capital guaranteed products) and derivatives. A well diversified and simply structured portfolio is more optimal in crises than an over- diversified one full of products depending on the issuer’s credit rating. More specifically investors should consider reducing USD and Equity exposure in order to increase Cash, Swiss Franc exposure and Gold (at these depressed levels). If a global investor has an overweight in USD vs an underweight in EUR and has benefitted the past three years from it, now would be a good time to consider begin shifting from USD into EUR, step by step of course. Short term the USD has the biggest downside of all major currencies, followed by the British Pound. Policy makers and major banks “pushed down” gold via financial transactions, partly to increase their gold reserves at lower prices. Do not trust official gold reserves data – we have credible indications many central banks have been buying more gold than what they report. And with no independent audits at central banks, I prefer to be a cautious skeptical economist. Many see the Swiss Franc as the top safe haven currency in case of a global crisis, but they miss one important type of event: large scale military conflicts. The USA being the only world military super-power would make the USD the top safe haven currency should such an event unfold. But we are not expecting events of that magnitude during Fall 2015. Longer term: After all big central banks from the USA, Europe, Japan… to China have reverted to massive money printing to keep economic growth going rather than addressing structural problems, all major currencies are debased. With highly diluted inherent values, major currencies are now being driven by unstable growth and inflation expectations. The most vulnerable sector of the world economy is the global financial market. Fewer firms want to depend on bank-credit as they use their own free cash-flow to grow and their internal financial operations to shield themselves against undercapitalized banks. Inflated asset prices: The major rally of the USD on the back of an unprecedented inflation in asset prices – driven by policy makers, leaves financial markets vulnerable and dependent on policy makers’ ability to normalize monetary policy without unleashing asset price corrections and a steep recession. Rather than allowing the economy to shrink from 2008 to 2013 as excessive consumption normalized, policy makers kept consumption going by orchestrating a 6-year rally in asset prices. Now, bond and equity prices look vulnerable. If we adjust corporate earnings for share-buy backs and extraordinarily low borrowing rates, they look fully priced if not stretched. Especially when you know that Discretionary Consumption in large consumer economies will suffer over the next ten years due to a fast deterioration of the Age Dependency Ratios. Compared and plotted to the VIX Volatility the Equity Market also looks somewhat vulnerable. My guess is that both Volatility could Equity prices could normalize and trend back to their historical means, thus volatility could spike and equity prices drop. As geopolitical, macroeconomic and financial forces converge in the 2nd Half 2015 a significant correction in risk assets (equities etc) is likely in September-October 2015. Stock markets could correct by as much as 25% to 50% over the next 24 months depending on policy makers’ response. We think prudent institutional investors, pension managers, decision makers and governments should prepare for it. Not only by proactively reducing risk exposures and readying contingencies plans, but also by being ready to increase exposure to risk assets (i.e. quality U.S. stocks, Swiss Confederation bonds ..) in the aftermath of a correction. Company executives could for instance protect their “war chest” and track the firms they would like to buy during such a correction or crisis. I am not foretelling a crisis this Fall, all I do is to stress that many of the things I’m monitoring and analyzing point to the high probability of such an event. Conditions are given, but something has to trigger it still. Possible triggers are in place, but which and when depends on complex interactions beyond one single person’s or even nation’s ability to control. This system can be used like a DEFCON for the economy, businesses and investors. We aim at updating it within 3 hours of a change in assessment. General Disclaimer: Global Macro and Geopolitical Analysis are highly complex and subject to sudden changes. No analytical method is without certain disadvantages. We may change our 3-pronged outlook within less than 3-6 hours following an event or data release, and we will prioritize informing and advising our “advisory clients” first. This website will be updated only after that is done. Global macro analysis can be extremely time-sensitive and the first 24 hours after an event are critical for the response of a corporation or pension. Only qualified investors should make use of macro reports and treat them as an additional independent perspective. Unseasoned investors could overreact and suffer losses they can’t bear in the first place. We don’t want them to act on our comments without consulting a professional adviser first. Every investor should carefully weigh different perspectives as well as opportunities and risks before making any investment or divestment decision. What is published on our website was written in average a few days earlier.